Turn off any sources of ignition or any device that can spark, including hot plates and Bunsen burners. OSHA classifies both xylene and xylene vapor as severe fire hazards. Turn on any ventilation devices, such as overhead laboratory fans or fume hoods, to reduce the risk of xylene vapor combustion (you cannot dispose of xylene vapor this way). Put on safety glasses and safety gloves. Xylene and xylene vapor can seep into the skin, eyes, mouth and lungs. Be careful not to inhale any of the xylene vapor. OSHA recommends that those not wearing protective equipment should leave the room. Place xylene in a nonchlorinated waste container for disposal. Store it outdoors or in an unoccupied building in a fire-proof storage unit. Call a chemical waste disposal service to remove the container containing xylene. 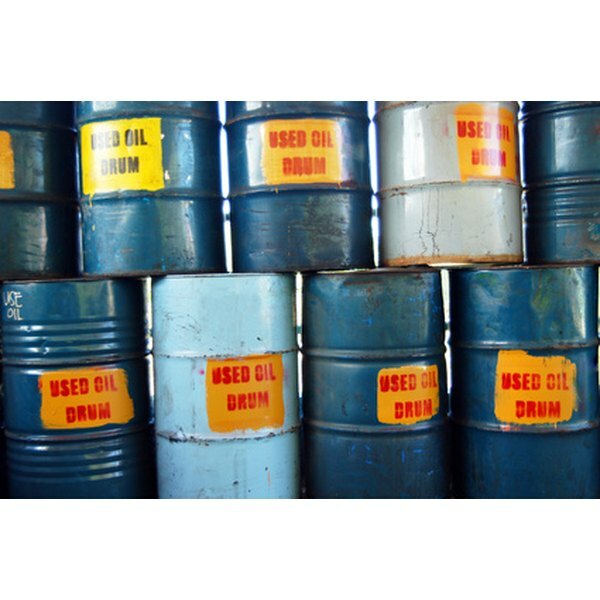 According to Practice Green Health, you must have xylene removed within three days of accumulating more than 55 gallons of this hazardous waste. Turn off any sources of ignition or any device that can spark, including hot plates and Bunsen burners. Toluene and toluene vapor are highly flammable. Put on safety glasses and safety gloves. Liquid toluene can chemically burn the skin, causing redness, and toluene vapor can damage the eyes. Be careful not to inhale any of the toluene vapor. Call a chemical waste disposal service to remove the container containing toluene. According to Practice Green Health, you must have toluene removed within three days of accumulating more than 55 gallons of this hazardous waste. What Are Safe Levels of Flouride for Pregnant Women & Newborns?